India’s borders with Nepal and Bangladesh have turned out to be the most active hot spots of illegal trade of tiger body parts, claims a new study report. Apart from the border areas, the report indicates that the Kerala-Tamil Nadu regions in South India as well as Madhya Pradesh in Central India are other potential hotspots of this illegal trade in the country. As per the figures in the report published by TRAFFIC, a global wildlife trade monitoring network, India recorded 44 per cent of all tiger body part seizures across the 13 Tiger Range Countries (TRCs) during 2000 to 2015. “An analysis of density estimation (of seizure incidents) to determine significant ‘hotspots’ of activity shows prominent clusters on the India-Nepal border and the India-Bangladesh border,” says the report. The analysis calls for an urgent need to take bilateral measures by the countries to enforce law in these areas to curb the trade. “These clusters are evident in the data for all four quarters, which indicates that these areas should be a target for concentrated law enforcement activities and investigations,” it says. The presence of these trade hotspots along the borders is mainly due to the lack of cross-border co-ordination, even after a rise in the reported incidents from this area since 2015. “This is deemed to be partially caused by stronger law enforcement efforts in India which has displaced the problem over the border into Nepal. Closer collaboration with India in the form of contingency planning may have prevented this displacement,” says the report. Analyzing the data for the 16 year period, the report shows that there are similar hotspots in the South as well as Central India which were active across all the four quarters, though not as significant as the border hotspots. 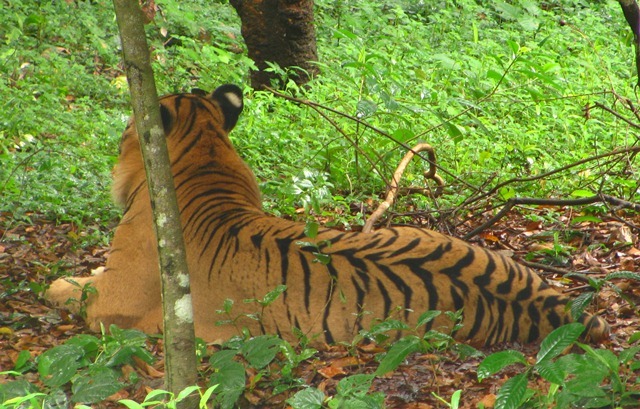 The seizure data for the last four years also shows their prominence, indicating their growing importance for future law enforcement for tiger conservation. “While the southern hotspot is still present, there also appears to have been a greater number of seizures reported in the central zone in and around the state of Madhya Pradesh,” Indicates the report. The analysis shows that there has been a steady decline in the number of tiger skins confiscated by authorities during the 16 year period across the TRCs. However, there is a marked increase in the number of tiger canines seized during the period, especially towards the last four years. “While the number of whole skins and skin pieces (which were confiscated) has decreased, more tiger canines were seized during the last quarter than the three previous quarters combined,” claims the report. However, in India tiger skins are the major tiger body part seized during the period, comprising 62 per cent of the total seizures. According to the report, 801 tiger seizures were reported during the period across the 13 TRCs, which includes India, Russia, Indonesia, Malaysia, Nepal, Thailand, Bangladesh, Bhutan, China, Viet Nam, Lao PDR, Cambodia and Myanmar. As per estimations, it may be equivalent to at least 1755 individual tigers.